The second profile on our social circus teams in Myanmar focuses on the Scholarships for Street Kids team, a group of children who usually don’t have much chance to learn or have fun. They’re aged between 8-16 and do not go to school; instead they work for around $2 per day to help support their families. The S4SK team training in front of a poster of Aung San, the father of modern Burma. Scholarships for Street Kids (S4SK) provides these children with out-of-school classes, giving them a chance to get an education. 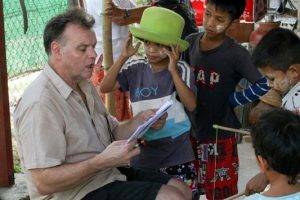 S4SK’s model is to encourage a community to find a venue where the children can be taught a few hours a week, then bring in teachers and resources to provide lessons. Each family receives a small payment to make up for the time the child can not work. 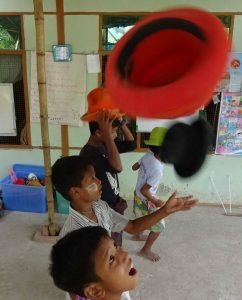 The S4SK children have been part of the Social Circus Myanmar project right from the start. Serious Fun training specialist Jules Howarth began teaching juggling to the children in 2014, as part of our activities leading to the international juggling festival in February 2015. 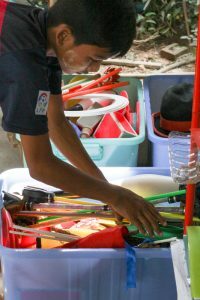 The first dry season’s workshops took place mainly in Hlegu, about 90 minutes outside Yangon, under trees in a dusty yard. 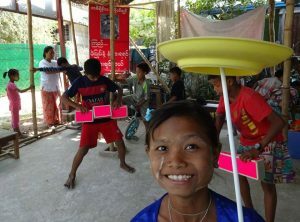 Last dry season, weekly circus skills workshops took place in a crowded space in Mingaladon in the outer suburbs of Yangon. The kids have made steady progress with various props, earning passes on their progress charts and having a lot of fun. 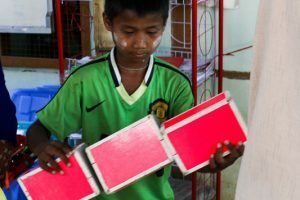 “Most of our children are child labourers and haven’t got the opportunity to play since they have to earn their family income,” said S4SK programme director Aye Aye Thinn. 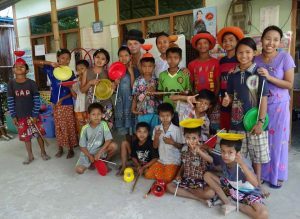 “Fortunately, we had the opportunity to provide play and training in circus skills and circus arts by connecting with Serious Fun. As the children’s technical skills develop, so too do their performance skills. Daw Aye Aye said the opportunity to show the public what they have achieved has had a lot of benefits. “When they had the opportunity of public performance in front of the audience, they felt proud of their existence, satisfied with their skills, aware and confident of their strengths. And they get an awareness of children’s participation, which is one of the child rights. “They also found out that sharing and caring for each was very important for success and happiness,” she said. They love the props, donated by our awesome juggling company supporters. S4SK would like to establish circus teams with their students in other areas. 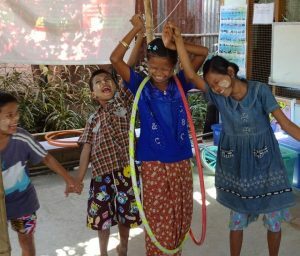 “The (social circus) project supports our children with educational, social and emotional development,”said Daw Aye Aye.